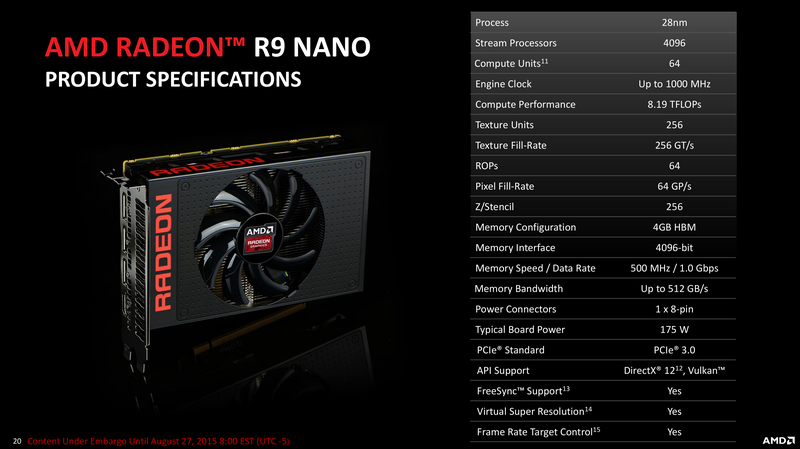 AMD's new Radeon R9 Nano graphics card packs more performance than a Radeon R9 290X, but measures a mere 6 inches long. Here's a look under the hood. Size, power, or noise: When it comes to graphics cards, you typically get to pick two at the expense of the third. 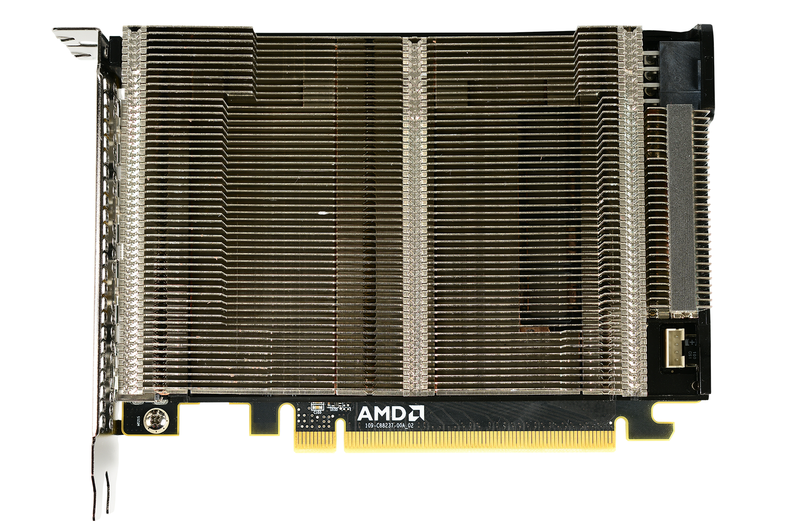 But AMD’s looking to shake things up with its powerful, yet pint-sized Radeon R9 Nano, a premium graphics card designed for itty-bitty mini-ATX builds and home theater PCs. The R9 Nano won’t quite make the August launch promised earlier this year, but the company’s revealing the card’s full list of features and design details ahead of a September 10 release date. And hot damn does it look intriguing. This card could, theoretically, transform a mini-ITX PC into a 4K gaming powerhouse without any of the usual compromise. The Radeon R9 Nano in a mini-ITX build. We’ve known some basics about the R9 Nano ever since its unveiling at E3 in June. 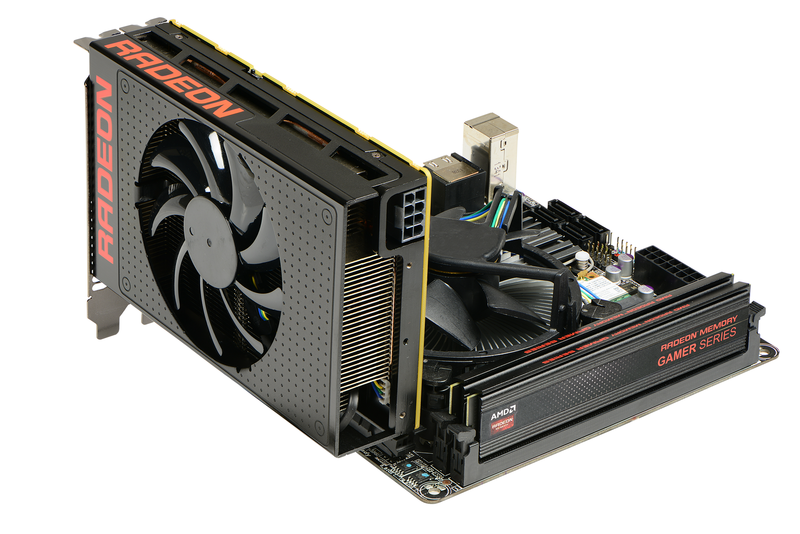 The 175W card measures a mere 6 inches in length, but packs up to 30 percent more performance oomph than AMD’s pre-Fury flagship, the Radeon R9 290X. The Nano’s Fiji GPU packs a full 4096 stream processors—more than the air-cooled Fury cards that meet or beat Nvidia’s GeForce GTX 980, and the exact same number found in AMD’s top-of-the-line Fury X, which itself featured a shortened board length. The Nano, like the Fury and Fury X, also boasts 4GB of revolutionary high-bandwidth memory clocked at 512GB/s and delivered over an ultra-wide 4096-bit bus. (The R9 Nano wouldn’t exist without HBM’s dramatic space savings over the traditional GPU/memory combo, actually). “In no way is this a cut-down, low-speed, ‘value’ product,” says Camardo. The Fiji GPU at the heart of the Radeon R9 Nano has 4096 stream processors and 4GB of on-die HBM memory (the four small squares around the large central GPU). Of course, stuffing all those stream processors into such a tiny package—and one that’s air-cooled, unlike the Fury X—does require some finessing. 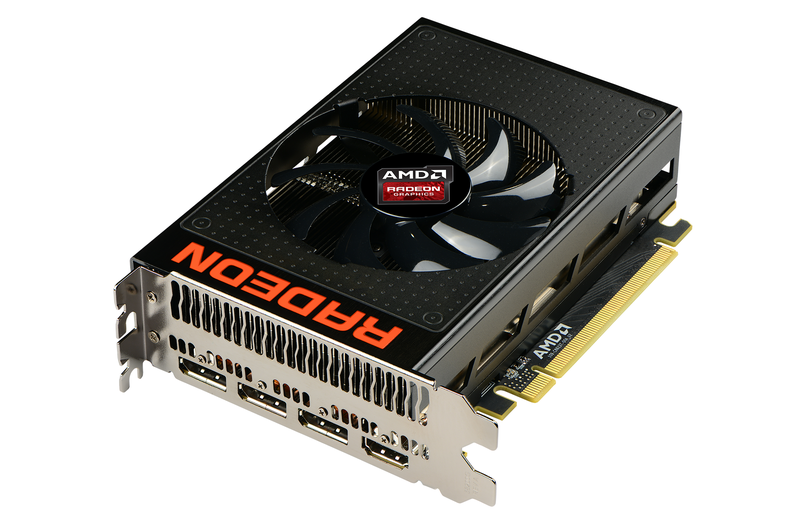 While the Fury X hits core GPU clock speeds up to 1050MHz, the R9 Nano dials that back to 1000MHz tops. More aggressive PowerTune settings, which keep the card pulling around 175W, mean you’ll more often see clock speeds around 900MHz during gameplay. In practice, Camardo said, you can expect to see performance levels around the same as the air-cooled Fury, which hit maxed-out 1440p or solid 4K gaming performance. “There’s nothing else in [the mini-ITX form factor] class that can drive a 4K display” in gaming, Camardo boasted. The Radeon R9 Nano packs four DisplayPort 1.2 ports and a single HDMI port. Sadly, Fiji features HDMI 1.4a rather than 2.0, so 4K signals over HDMI are limited to 30Hz—a disappointing drawback in a card otherwise well suited for use in a powerful home theater PC. 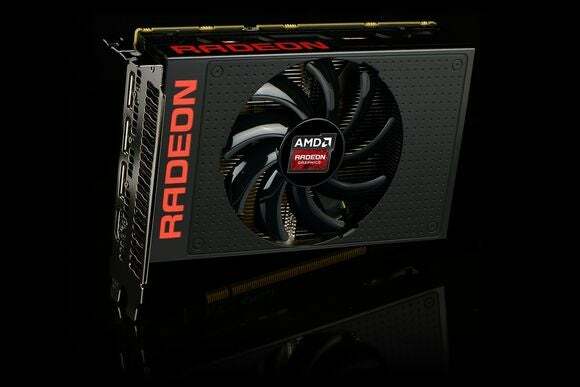 If you wanted to push things even further, you could move the card’s power target higher and overclock its core (but not memory) speed—but in doing so you’ll be negating some of the Radeon Nano’s key features: Its paltry 175W power requirement, and its quietness. AMD says the card runs at a mere 42 decibels, or the same relative ambient noise level as a library. That’s a full 16 decibels softer than the Radeon R9 290X’s noise under load. 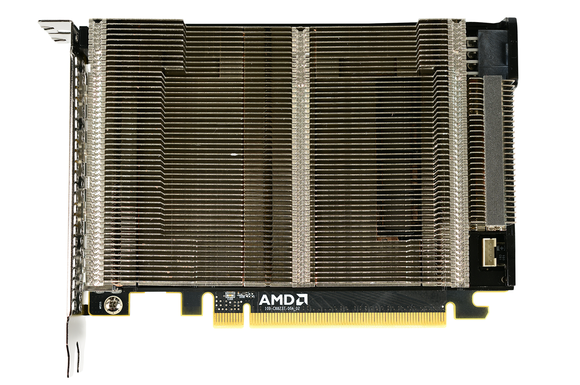 AMD paid attention to complaints about the horrid coolers on reference card designs for the R200-series graphics cards, too. The Nano aims for a 75C temperature while gaming, or 20 degrees less than the R9 290X. And that’s with an air cooler and a six-inch length! That sort of efficiency can be chalked up partly to Fiji’s vastly improved power handling—AMD boasts it offers up to twice the performance per watt compared to the 290X. Camardo says the company placed a lot of thought into the Nano’s cooling design as well. “We spared no expense, we left no stone unturned, and we really pushed our engineering teams to do their utmost,” Camardo said of the Nano’s cooling. You can see the copper vapor chamber and heat pipes in this look from the bottom (a.k.a.’s GPU’s-eye view) of the Radeon R9 Nano’s cooling solution. AMD intentionally arranged the heat sink’s fans to run horizontally across the Nano, the easier to blow hot air out of the case rather than down at the motherboard. Underneath, the GPU’s cooled using a hybrid flattened heatpipe/vapor chamber solution. 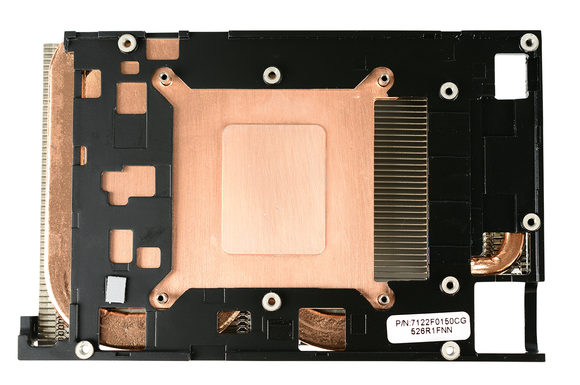 There’s no backplate on the card, in order to help facilitate air circulation to the board, and the fan itself is integrated into the card’s shroud—which means you won’t be able to 3D-print your own Nano front plate, as you can with the Fury X. A lot at the Radeon R9 Nano’s heat sink, with horizontal fins. Aesthetically, the Radeon R9 Nano takes its design cues from the Fury X, with a brushed-aluminum finish, metal shroud, and matte-black PCB. That’s nothing but a good thing, as the gorgeous Fury X absolutely screams “premium” from every pore. And if you disagree, well, you’re out of luck: The Nano will only be available in its reference design at launch, though Camardo says you may see custom variants from board partners late in the year, at least three months after the Nano’s launch. If those do come to fruition, they’ll be visual tweaks only—under the hood, custom variants will pack the same configuration as AMD’s reference Nano. An AMD-supplied timeline of the type of PC you needed to play 4K games over the years. 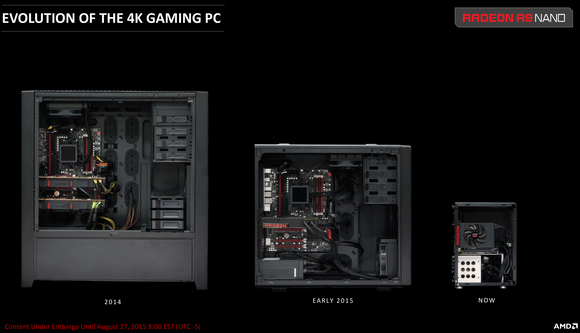 AMD’s keen to point out just how far 4K gaming PCs have come in such a short time. Just last year, playing games at 4K resolution required the use of multiple high-end graphics cards in a massive PC tower. Earlier this year, the launch of graphics cards like Nvidia’s beastly GeForce GTX 980 Ti and AMD’s Radeon Fury X finally enabled true single-GPU 4K gaming. And now, mere months later, the Radeon Nano is promising to bring ultra-high-resolution gaming into itty-bitty mini-ITX boxes even smaller than AMD’s radical Project Quantum PC. Well, if AMD’s power and performance claims hold true in real life, that is. 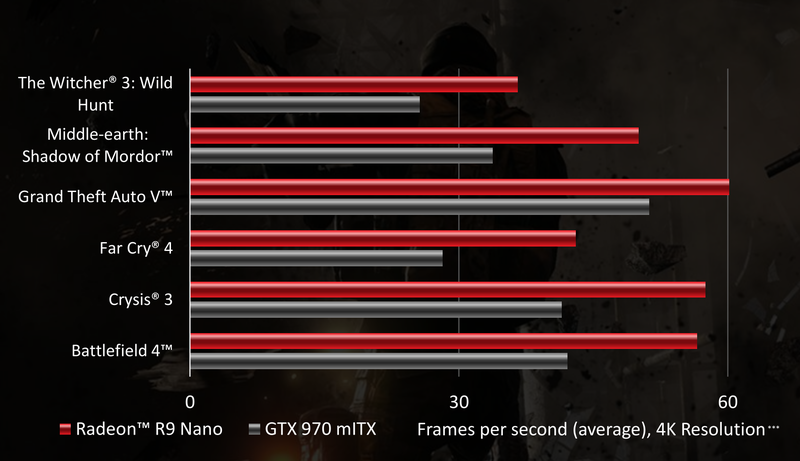 AMD-supplied performance benchmarks comparing the Radeon R9 Nano with a mini-ITX GTX 970. Testing conducted on a 3.0HGz Core i7-5960X, 16GB of 2166MHz DDR4 memory, Windows 10 64-bit. AMD Catalyst 15.20 and GeForce 355.60 WHQL drivers used. We won’t know for sure if reality matches the promise until we get our hands on the Nano, but the song AMD’s singing sounds pretty darn enticing in theory. And AMD knows just how unique this card is: the Radeon R9 Nano will retail for $650, the same price as the water-cooled Radeon Fury X and Nvidia’s GTX 980 Ti, when it hits stores on September 10. Look for independent reviews to land around the same time.